So your company’s holding a Dinner and Dance soon. You’ve gotten the bee in your bonnet to wear a kimono. Which do you choose? In fact, there are nearly a dozen types of kimono available to you, all with varying degrees of formality and appropriateness, that selecting one can seem totally mystifying to most. Not to mention that you have to pick the obi, of which there are four types, accessories and shoes. In order to help us gaijins, I’ve compiled a list of kimono and accompanying obis and shoes according to their degree of formality or appropriateness (i.e. married or not?). However, I will not be including Uchikake, Kakeshita or Shiromuku in my list, since all three are for brides to wear on their wedding day. I will, instead, be focusing on the kimono that most of us would wear practically and for a variety of reasons or occasions. Once again, I’ll bring in the whole disclaimer of “I am not an expert”. If I do make any mistakes, please leave a comment to let me know. Occasions: Weddings or other formal events. Description: The Kurotomesode comes in all black with bright designs on the lower part of the kimono. It comes with 5 or 3 family crests, or kamon, that distinguish the formality of the kimono. If one is a relative of the bride, one wears the Kurotomesode with a white inner collar, obi age and obi jime. This is to contrast the bride’s white kimono. The Irotomesode is the brighter coloured version of the tomesode where the base comes in different colours. It is worn by married women who are not related to the bride at weddings. Shoes: Zori for tomesode, with silk decoration attached at the heel, white tabi. Occasions: Coming of Age Ceremony, weddings and other formal events. Shoes: Zori for furisode, with silk decoration attached at the heel, white tabi. Occasions: Can be worn at most occasions. Description: The Houmongi is categorized by the patterns which flow over the seams, shoulders and sleeves. It is the most versatile of kimonos which can be worn to most occasions depending on how many kamon it has. Occasions: Can be worn at most semi-formal occasions, have personally worn one to a dinner and dance before. 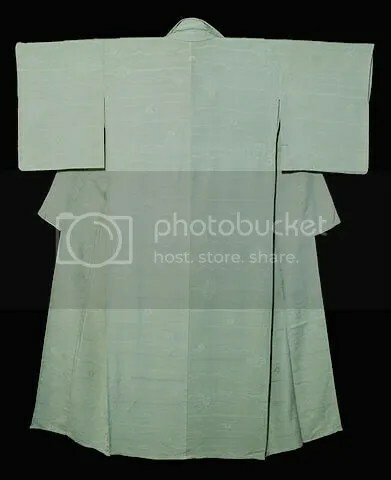 Description: The Tsukesage is identified by the patterns that occupy small areas, usually below the waist and sometimes accented on the sleeves. It is slightly less formal than the Houmongi. Description: The Iromuji is identified by its solid colours. While there may be figures on the dyed silk, there is no pattern of other colours. Shoes: Zori with tabi of white or different colours. Description: The Komon is characterized by its patterns that are small and repeated. It is the most informal of kimonos (with the exception of yukata, which I think should be in a different category) and suitable for casual wear. Blossom’s kimono is a Komon. Consider your occasion, its level of formality and whether or not you’re married (which hopefully shouldn’t take you too long). From there, choose your kimono accordingly. The general rule of thumb is that if you’re married, choose more subdued colours. Unmarried girls tend to be able to get away with the more garish pinks and blues. Once chosen, proceed with coordination as talked about in a previous post. Let me just give some word of advice on wearing kimono to a dinner and dance: 1) don’t tie things too tight or you might not be able to eat the awesome free food, let alone breathe; 2) be prepared to be a talking point and photo object – which I frankly loved, being the humble person that I am; 3) watch how you sit, lest you expose your unmentionables to the world as your kimono opens up at the legs. I have a kitsuke book which goes into more details about the formality of obi according to whether it is woven or dyed. But let’s not go into that. Generally speaking non-Japanese get away with not following rules. Ah, thanks for pointing it out. I was quite unsure since most sites and sources I’ve come across seem to use it interchangeably. Turns out komon refers to the pattern woven into the fabric and not the crest per se and ‘komon’ is also used to refer to a type of kimono too. Plus, while we do get away with it. It’s important to try to get the ocassions right.